Give us a break between Grands Prix and we start to scrape the bottom of the barrel for F1 news. Formula 1 Sport has the exciting story that Alonso has turned down an invite to go frolicking in the Mediterranean with Hamilton and Mansour Ojjeh's daughter, and then backs it up with news of Flavio's and Bernie's attempts to buy British football teams. F1-Live attempts to keep the Spyker story alive with Michiel Mol's confirmation that he might buy the team and Pitpass, obviously in desperation, just runs an advert for their sponsors. The only real news is that Prodrive has been stung by suggestions that they might not make it to the grid next year and have advised that they are working away quietly behind the scenes. Everyone has this one, although Grand Prix dot com's is probably the most interesting, since it adds information about the relationship between Prodrive and McLaren. It is still largely speculation, however. And, while on the subject of speculation, has anyone thought about how convenient it would be for Prodrive to run a McLaren chassis if everything does not go to plan in the forthcoming FIA appeal case? If the worst happens and the court decides to slap a year's ban on McLaren, Prodrive could be in a very interesting position as unofficial McLaren representative in the coming season. Come to think of it, that could be another very good reason for each manufacturer to have a B team in F1 - sort of FIA insurance, you could say. It does say something about this interminable mid-season break, however. When the only news item worthy of the name is a matter of possibilities and guesses, it shows very clearly that F1 has gone on vacation. Time for the hacks to dig out the history files and crystal balls, indeed. "Pitpass, obviously in desperation, just runs an advert for their sponsors." You could always write about MotoGP! How about a Scott Speed Blog? Or a Blog of a Europeans view on American Motor racing? I think we need an educated spectator give his view on road racing in the Sates. I'm a little sick of the NASCAR stereotype. 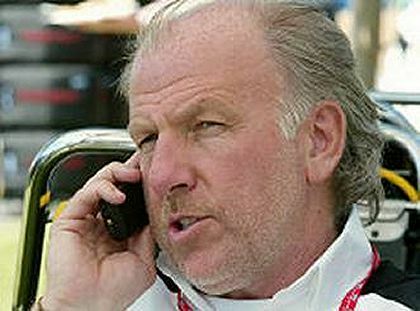 Now that Stepney is etentially without of job, maybe he could become Mosley's right hand man so he can EMAIL us with info on why the hell the FiA do stupid things like have a month long break during the best part of the season. A Scott Speed blog is not a bad idea at all, Dan. I would have to do my homework and learn a lot more about NASCAR racing since it looks as though that's where he's heading. I thought about doing a NASCAR blog once before and looked at few existing ones - couldn't understand a word as they seem to speak a different language. But yeah, it's not impossible. A European's view of American racing is a good idea too but who would read it? I couldn't hope to be as knowledgeable as the local writers on it so I'd basically be writing about my own ignorance. Maybe we could change it around a bit and make it a European's journey into the world of American racing. Then those Europeans who want to know more might become interested. Certainly worth thinking about. I love the FIA-insurance idea, seems Red Bull were ahead of the game there! I can't imagine the FIA allowing a customer team to run a non-Ferrari car that they believed may have Ferrari bits on it. This could in fact be delaying the announcement of Prodrive's plans - if the FIA decides the McLaren is illegal, there is no way that Prodrive will be running a 2006 McLaren (too unreliable, for a start!) So it may well be that David Richards is simply making sure he has a legal and usable chassis next year before announcing anything. As for the difficulties in writing a blog at this sort of time, Clive, I can sympathise. I will probably write a Spyker post soon, but I want a little more info first. Until then, my blog is basically given over to a... ...erm... ...project. Ah, but would not Prodrive be using a 2008 chassis, Alianora? McLaren will be starting the design of next year's car around about now and it could have progressed quite far by the time the appeal court reaches a verdict. If the court bans McLaren for next year, Prodrive may well provide the team with a reason to continue development and production of the new model. McLaren would be staying in the game and not suffering the serious disadvantage of a year away from the pressure cooker development world that is racing. And the FIA could not object because there would be no Ferrari technology involved in the new car. Hmm, I did not know that Speed was going to NASCAR, I was pulling for Champ Car. I think he would just get lost in the 42 car field. Even Montoya, who was a pretty good F1 driver is lucky to be in the top 10 on the ovals. And to think, IRL requires even less skill! Yes, I was hoping for Champ Cars for Speed too, Dan. But Dietrich Mateschitz, head of Red Bull, is apparently keen for Scott to drive one of his team's cars in NASCAR. So, if Scott can't find someone to take him on in a CC team, I guess it'll have to be NASCAR. I agree with you about NASCAR too - it's a bit of a lottery and, if Montoya can't dominate it, Speed will almost certainly have difficulty shining there. It may be all he wants - just racing for a living - but I would much prefer to see him in a series where quality counts. I've had another thought, though. Prodrive may be using a 2008 chassis, but how much would the 2008 chassis depend on 2007 designs? If the court bans the 2007 car, then only a complete redesign of the 2008 car would guarantee that Ferrari could not get the 2008 car banned on the same basis. This would apply whether McLaren, Prodrive or anyone else was running the car. This is quite worrying, and I can only hope that a) McLaren managed to isolate the Stepney/Coughlan issue to those two individuals and b) the McLaren doesn't get banned on the basis of Ferrari components being present. Even in the worst case scenario of a season's ban, I think the FIA have to draw the line somewhere. If you use the "development of ideas from Ferrari's original" argument, where does that end? It could be said that all F1 cars are developments of what has gone before (except for complete innovations and they don't happen anymore) so the argument would mean that McLaren can never again produce an F1 car. A season's ban is pretty draconian punishment for something that is almost impossible to prove anyway, so I cannot see the FIA agreeing to extend it to the design of the 2008 car without absolute proof that it contains ideas developed from the Ferrari plans. The punishment would be for using Ferrari ideas in the design or development of this year's car and that must surely be that. Realistically, the only excuse for the FIA handing out a penalty in the case would be for having Coughlan as an employee and the fact that he may have mentioned the plans to others in the company. Proving that any more than that happened would be extremely difficult - Ferrari may rant all they like about what they suspect happened but, without proof, it is a rant and nothing else. Essentially, I see the appeal as being against sentence rather than judgement. The court has already said that McLaren were guilty in that Coughlan was employed by them - Ferrari really object because they think that the verdict should carry a penalty. But a ban would be more than the "crime" deserves - much more likely is a fine.